Unlike many other religions, Buddhism does not have a single canon of scriptures. This means that sutras venerated by one school of Buddhism may be considered inauthentic in another. See Buddhist Scripture: An Overview for some basic background. Within Mahayana Buddhism, there are two basic canons, called the "Chinese" and the "Tibetan" canons. This article explains what texts are found in the Tibetan canon, which are the scriptures of Tibetan Buddhism. 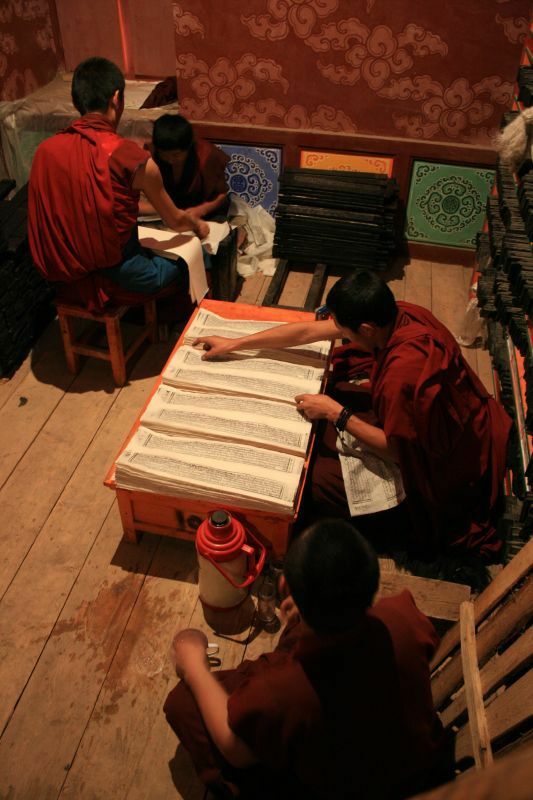 The Tibetan canon is divided into two parts, called the Kangyur and the Tengyur. The Kangyur contains texts attributed to a Buddha, either the historical Buddha or another one. The Tengyur texts are commentaries, most written by Indian dharma masters. Most of these many hundreds of texts were originally in Sanskrit and came to Tibet from India over a period of centuries. The work of translating the texts into Tibetan began in 7th century and continued until the mid 9th century when Tibet entered a period of political instability.Translating resumed in the 10th century, and the two parts of the canon may have been largely complete by the 14th century. Most editions in use today are from versions printed in the 17th and 18th centuries. As with other Buddhist scriptures, the volumes in the Kangyur and Tengyur are not believed to be the revelations of a god. The exact number of volumes and texts in the Kangyur varies from one edition to another. An edition associated with Narthang Monastery has 98 volumes, for example, but other versions have as many as 120 volumes. There are at least six slightly different versions of the Kangyur. Vinaya. The Vinaya contains the Buddha's rules for the monastic orders. Tibetans follow the Mulasarvastivada Vinaya, one of three extant versions. Tibetans associate this Vinaya with an early school of Buddhism called Sarvastivada, but many historians dispute that connection. Prajnaparamita. The Prajnaparamita (perfection of wisdom) is a collection of sutras associated with the Madhyamika school and that are known primarily for their development of the doctrine of sunyata. The Heart and Diamond sutras are both from this group of scriptures. Avatamsaka. The Avatamsaka Sutra is a large collection of texts focusing on how reality appears to an enlightened being. It is best known for its sumptuous descriptions of the inter-existence of all phenomena. Ratnakuta. The Ratnakuta, or Jewel Heap, is a collection of very early Mahayana sutras that provided a foundation for the Madhyamika school. Other Sutras. There are about 270 texts in this section. About three-fourths are Mahayana in origin and the remainder come from Theravada or a predecessor of Theravada. Many of these are texts rarely found outside of Tibetan Buddhism, such as the The Arya-Bodhisattva-gocara-upayaisaya-vikurvana-nirdesa-nama-mahayana-sutra. Others are more widely known, such as the Vimalakirti Sutra. Tantra. Buddhist tantra is, very simply, a means to enlightenment through identity with tantric deities. Many texts in this section describe chants and rituals. Tengyer means “the translated treatises.” Most of the Tengyur was written by Indian teachers no later than the 13th century, and many texts are considerably older. There are also some commentaries by prominent Tibetan teachers. The several editions of the Tengyur generally contain about 3,600 of more separate texts. The texts in the Tengyur are something of a grab-bag. There are hymns of praise and commentaries on the tantras and sutras in the Kangyur and on the Vinaya.. There you also will find the Abhidharma and Jataka Tales. Many treatises are on Yogacara and Madhyamika philosophy. There are books of Tibetan medicine, poems, stories and myths. The Kangyur and Tengyur have guided Tibetan Buddhists for 13th centuries, and when put together they become one of the world's richest collections of religious literature. Many of these texts to be translated into English and other western languages, and it's probably the case that few complete editions can be found outside of Tibetan monastery libraries.An edition in book form was published in China a few years ago, but it costs several thousand dollars. Someday there no doubt will be a complete English translation on the Web, but we're a few years away from that.